Panchal Mansaram, who prefers to be identified as just Mansaram, was helped by Marshall McLuhan when he and his family immigrated to Canada from India in 1966. Later, McLuhan collaborated with Mansaram on a collage painting that was influenced by McLuhan’s ideas titled Rear View Mirror 74 (RVM 74) by personally adding some of the textual content. I published an article about McLuhan and Mansaram which was published first online in the Journal of Cross-Cultural Image Studies, which you can read here https://goo.gl/6dUQn4 and then later in print by the University of Winnipeg (see here https://goo.gl/gGGqn8 ). The exhibition The Medium is the Medium is the Medium presents works by media artist P. Mansaram and thinks through the artist’s decades-long practice of repetition. For Mansaram, repetition is art practice, repetition is meditation, repetition is spirituality, repetition is falling in love, and as he says, repetition is a way to finding god. 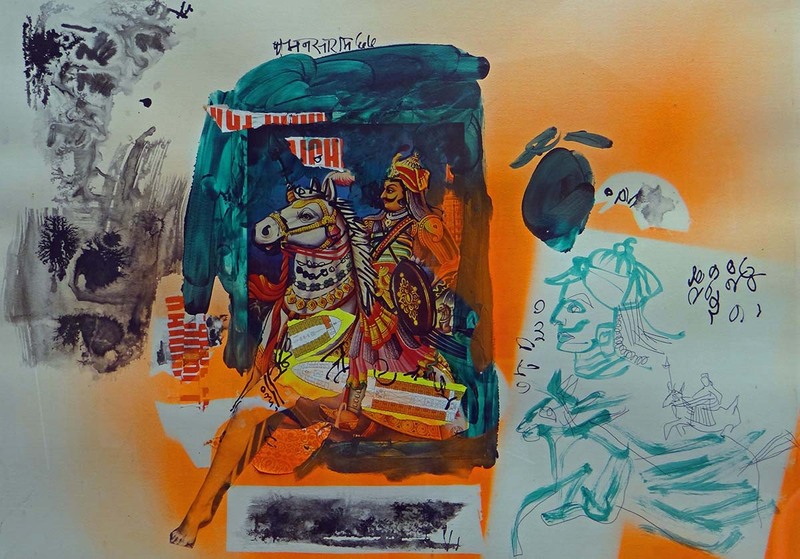 Strategically using recurrence and reproduction through a variety of medium including drawing, painting, collage, text, sculpture, xerox, silkscreen printmaking, and film, Mansaram’s work invokes unending feelings of travel: through time, dimension and territory. Spanning more than five decades, the selection of works highlights both material and spiritual elements from the artists’ surroundings and everyday life–including characters, symbols and spaces–to convey the artist’s meditative and transcendent processes in both form and content. In that regard, the ways in which Mansaram assembles different media and creates a sense of place present the viewer with a nuanced narrative of the diasporic experience. Over the past decade, SAVAC has presented Mansaram’s work in several group programs and we are delighted to be able to shine a spotlight on his long career in this solo exhibition. Continuously tinkering with old works in response to contemporary shifts, Mansaram holds the rare ability of keeping an ever-evolving artistic practice that is both timely and germane. Our Supporters – We gratefully acknowledge operating support from the Canada Council for the Arts, the Ontario Arts Council and Toronto Arts Council. It is intriguing to learn that Mansaram’s art includes painting and text and equally intriguing to learn of the centrality of repetition in his work. It reminds me that Gertrude Stein always claimed that there was a crucial link between how she put words on paper and how Picasso put paint on canvas. At the same time, she made a distinction between repetition and insistence, the latter being, for her a repetition with a chance of emphasis. It will be interesting to discover if that distinction applies to Mansaram’s work in the same way that it applies to Stein and Picasso. Thanks for the comment, Terry. The art that includes both text and images in Mansaram’s work was specifically in his collages, like the one that MM contributed to by adding modified phrases and quotes.